A new service commencing in August 2019 when school returns for the Autumn Term. The coach will serve the villages of Witherley and Fenny Drayton with a direct service to and from The Market Bosworth School. Annual passes can be purchased which will allow return travel, by coach, on this new dedicated service. 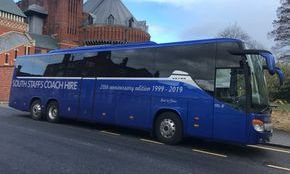 The service will be operated by South Staffs Coach Hire in conjunction with the school. The service will operate daily with an AM journey to school and a PM return journey from school. The coach will drop off and collect from the school bus park alongside the existing school services. School staff will load the students onto the service at the end of the day. This is a closed door service and we will only allow students from TMBS, who have purchased passes, to travel on the vehicle. You will be able to purchase annual passes direct through this website. The cost is £66 per month over 12 months per pass. You will be able to pay monthly by standing order, the first payment being due before 20th August 2019. The monthly payments will then continue monthly until July which will complete the travel pass payment for the school year. We have divided the cost over 12 equal months to keep the payments manageable. At the end of the first year you may wish to reserve a seat for the following school year. If so simply leave your standing order open and as soon as we receive the August payment we will issue the travel pass for the following school year. Please kindly note all passes and payments for this service are being managed by the coach company - not the school. We must ask you to pre-register for the new service. This will ensure enough seats are provided. We will then email you the details to set up the standing order. When you set up your standing order simply let us know and we will ask you to forward a photograph of the student so we can issue the pass. Passes will normally be collected from the driver on the first school day. In order to secure a place on this service you will need to email us using the link below, confirming you wish to secure a place on the service and purchase an annual pass for travel. Please remember to tell us who you are, how many students and where they will be boarding the service.